If you have the Thesis wordpress theme, you can easily create custom pages without the need to write any code. Why you do need to create custom pages or templates? 1.Mainly, it is to cater for different objective/ function of the page. For example, you may want your homepage to look different or create a specific page to funnel in traffic or email signups. 2. Custom pages helps you to be able to maintain wider topics in a single blog. Creating custom pages enable you to have a divide a single blog/site into different segments and categories because you can control the display output of each category/section’s related page. For this page that you are accessing, you would see a listing of other articles related to Thesis theme on the sidebar of the same page. Whereas on a blog posts on blogging, it would be more of a blogging article. Custom pages enables you to do testing on performance of certain functions that you wish to implement. For example, if you wish to test if your sign up page performs better if you place the email sign up box above, in the middle or below the custom page, then you may consider trying out by having some pages/posts display the elements that you want and then monitor to see the results. If you are monetizing with Adsense, you can create custom Adsense ads and add to custom pages to test its performance based on placement locations without the need to manually input the code on each page. I am using Thesis version 2.3 onwards (upgraded from Thesis 1.85). For this, I will be using screen shots that I have used in a previous article. 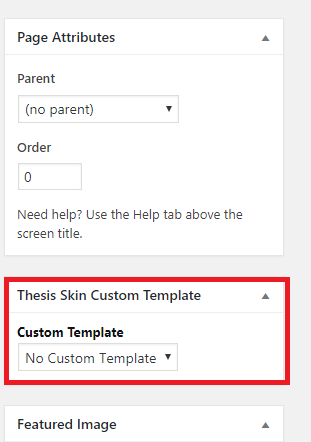 At your dashboard, go to Thesis> Skin Editor> Canvas. The “Home” option will automatically be displayed. Click on “Home” and you would see the screen below with “Core Templates”, “Custom Templates” and “Copy from Template”. After copying, the new page would display the template that you wanted. You can use the Shift + Drag function from the Grey Box to add or remove page elements that you wish. Reminder: Do NOT Shift + Drag anything to the pink box unless you want to permanently delete the element across all your template. Example if you accidentally shifted your “Content” box to the pink box, upon saving the template, your entire site will lose a “content” section….resulting that you are unable to display your blog post. Now you have created a custom template page, how to get the page that you wanted to display the elements of the custom page? The published page/ post would display the custom template that you have just created. You would be able to do the same for all future blog posts that you are publishing. How about older blog posts that were published before you installed Thesis wordpress theme? 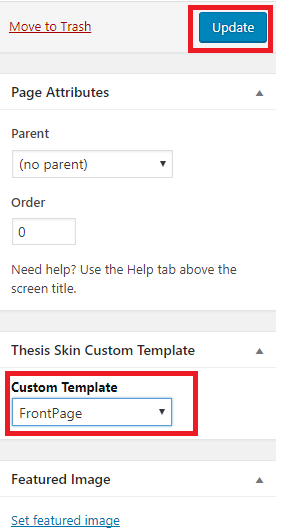 If you wish to have some older posts/pages to display the new element of your custom page, then you would need to go back in the edit function and then manually change the “Thesis Skin Custom Template” to display the custom page that you want. I really did such a cleanup exercise on my other blogs when I want to restructure the navigation and focus on each blog. The exercise was a bit painful because I was updating for hundreds of blog posts that I have published in the past years. But the results are well worth it because I have seen my average visited pages change from 1.4 to 3.64.